Learn how to create your own unique custom window by combining several standard library windows, allowing this feature window to show up properly in schedules. Adapted from a question sent in to my ARCHICAD Coaching Program in which I help ARCHICAD users apply my Best Practices methods in the context of real world projects. Learn how to use ArchiCAD’s Morph tool, a powerful and flexible modeling element. See how morphs can be quickly adapted for use as a trimming tool (creating a sculptured top for a wall), surface trim as in Tudor-style houses, and moulded casings around doors and windows. Learn how to bring in 2D drawings such as DWG files as a tracing reference to make it easy and fast to create an accurate 3D model. This approach can be used for modeling existing buildings from CAD files, or taking a design from 2D CAD into a 3D model quickly for presentations or model coordination. Learn how to accurately create a site model from an imported survey using the Mesh and Slab tools and add basic landscaping with the Object tool. Place a DWG or PDF survey file into a Worksheet and use it as a Trace Reference to precisely model your site topography; use Solid Element Operations (SEO) to cut out volumes where the building is placed. 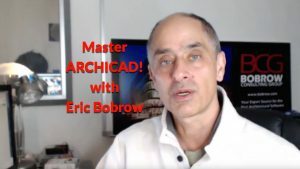 Learn how to model a wide variety of roof types and conditions in ARCHICAD in this in-depth tutorial by ARCHICAD master Eric Bobrow. Covers settings, placement and editing. Created in ArchiCAD 15 however these methods apply to ALL later versions. This tutorial (21 minutes) demonstrates how to set up 3D cutaways in a wide variety of ways, plus explores options to selectively display elements by layer, type, story or renovation status. Use these for design and presentation. In this 24 minute video, I share some of my favorite quick tricks to optimize lighting and adjust Surface settings to improve your ARCHICAD 3D window views. PLUS: Swap in and out different sets of Surfaces to study and compare schemes! This tutorial (19 minutes) demonstrates interesting new ARCHICAD View options that allow you to use the same Elevation and Section markers for both rendered (shaded) views and construction document drawings. You’ll also see some easy ways to add accurate or graphic shadows to add depth to a presentation site plan. In this first tutorial in the new ARCHICAD Design | Views series (24 minutes) I demonstrate how you can set up simplified or sketch-style drawings in ARCHICAD for client meetings and proposals. Sometimes it’s advantageous to show less detail – or give a feeling of tentative, preliminary design – rather than use a hard-edged, overly detailed view.